The Social screen in your mobile app’s At-The-Event module enables your app subscribers to post photos and text messages about the event and respond to each other’s content. The Social screen aggegates posts from the In-app form as well as posts to Instagram and Twitter featuring the event’s hashtag. To post to the Social screen, the app subscriber taps on the pencil icon and selects the platform they would like to use to share their content. 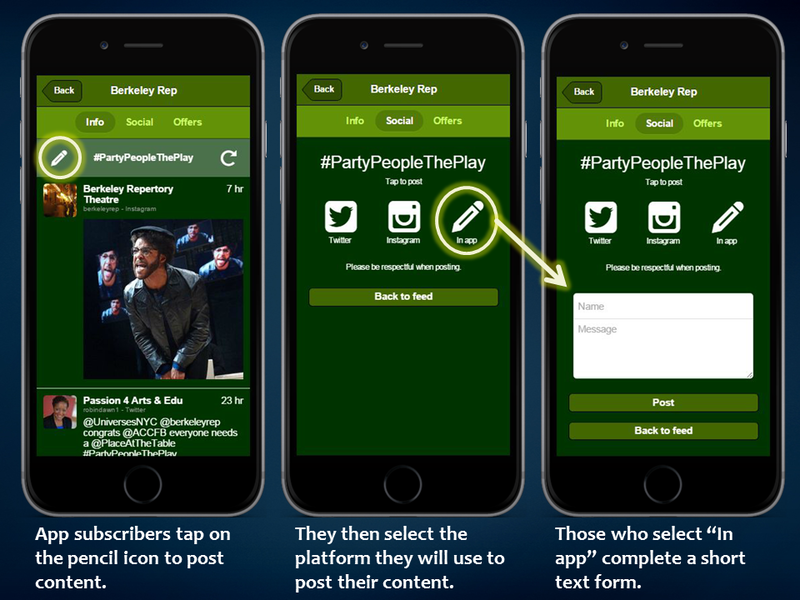 Example: The Social screen for Berkeley Repertory Theatre’s production of Party People. Simply providing the tool, however, does not mean that your app subscribers will use it. So how can you encourage your audience to engage via social media when they are at your performance? Culture Track 2014 recently surveyed patrons to determine how they use their mobile devices while attending cultural events. The most popular activities among respondents were taking photos (66%) and sharing photos (47%). Some arts organizations are rightfully concerned about copyright issues and the potential for disrupting a performance. So, here are some ideas for encouraging photo taking and sharing while simultaneously protecting copyright and the integrity of the live performance. Selfie Campaigns – “Selfies” are photographs that mobile users take of themselves and their friends using their smartphones or tablets. Selfie campaigns have emerged among arts organizations as a way to galvanize social media participation among audiences. 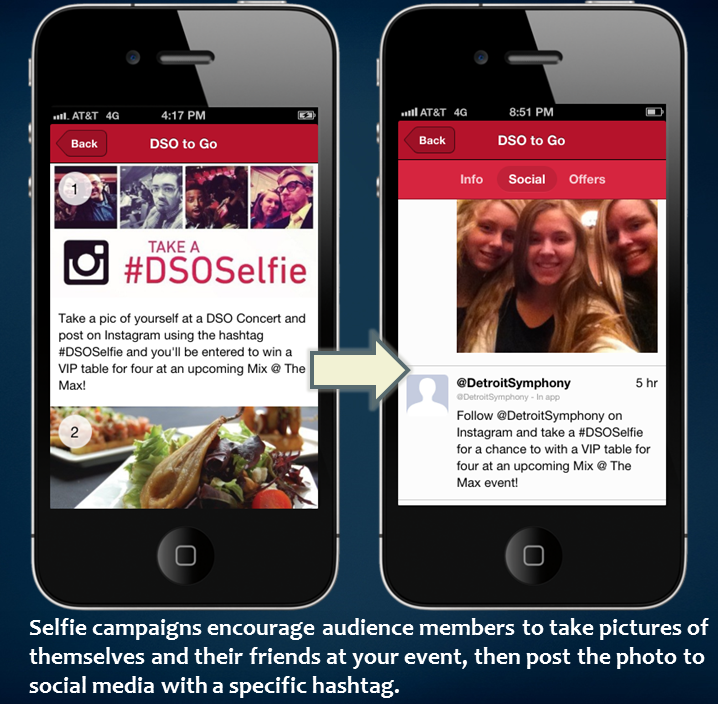 Selfie campaigns encourage patrons to take photos of themselves and their friends at your event and post it to social media with a corresponding hashtag. Both Twitter and Instagram allow mobile users to post pictures from their devices, which makes it easy for your app subscribers to post photos to the Social screen. Promote the selfie campaign within the app by (1) using the Spotlight Text area on the Info screen, (2) including it as one of the items in Things to Know (see the example below), and/or (3) linking from the Info screen to a custom tab describing the campaign. Consider incentivizing selfie campaigns by offering participants a chance to win a backstage tour, a chance to meet the artists, tickets to upcoming shows, etc. participants the chance to win a VIP table for 4 at an upcoming event. Selfie Stations – Take your selfie campaign to the next level by setting up “selfie stations” where patrons are encouraged to take pictures of themselves and their friends with artists, background images, or props featured in the event.Example: For their production of A Christmas Story, The Musical, Dallas Summer Musicals created a selfie station with a cardboard cut-out of the character Ralphie and the show’s iconic leg-shaped lamp. The station also featured a background with DSM’s logo. prop at the Dallas Summer Musical’s production of A Christmas Story, The Musical. Volunteer Selfie Takers – Sometimes, it’s difficult to get a great photo when you have to hold the camera yourself. Help your patrons get the best possible photo at your event by providing volunteer selfie takers. They are responsible for offering to take pictures of patrons using the audience member’s mobile device and encouraging patrons to post their photos to Twitter or Instagram with the events hashtag. 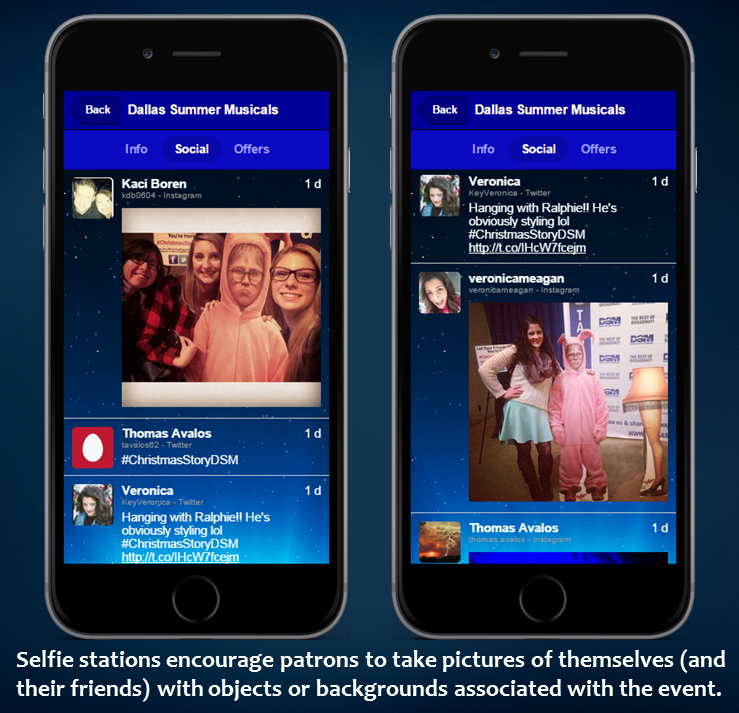 Position volunteers at selfie stations, near iconic artwork in the venue, or roaming throughout public areas before the performance, during intermission, and after the show. By using a term like “selfie taker” or “photo taker,” you reduce any expection for the volunteers to be professional photographers. Invite Questions – For most live performances, the audience does not have an opportunity to directly engage with the artists. The Social screen can serve to facilitate conversation between artists and your patrons by inviting app subscribers to submit questions for artists to answer. 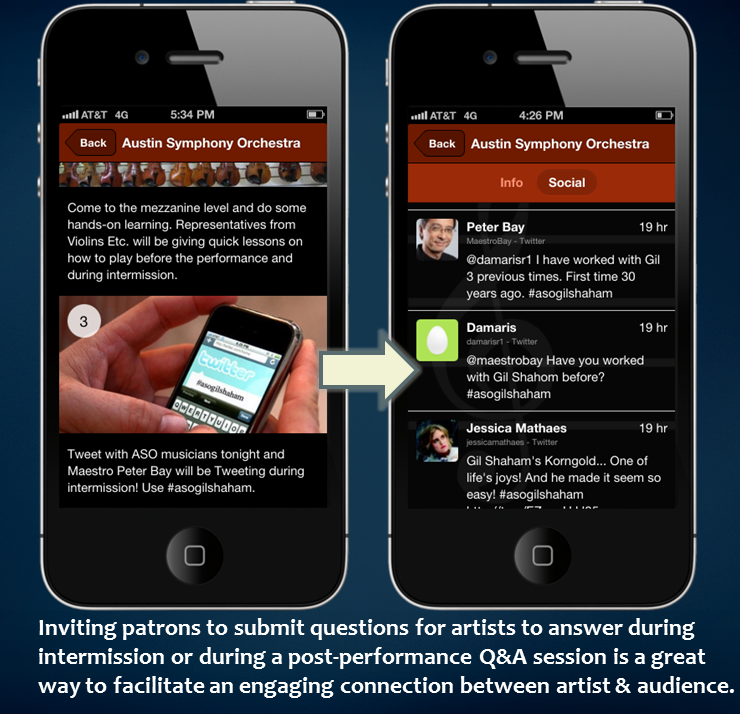 The questions may be answered directly by the artist within the app or during a live post-performance Q&A session. Use signage in public spaces and a mention in the printed program to invite patrons to download your app and submit their questions. Within the app, use the Spotlight Text area on the Info screen or an item in Things to Know to invite your app subscribers to submit their questions. 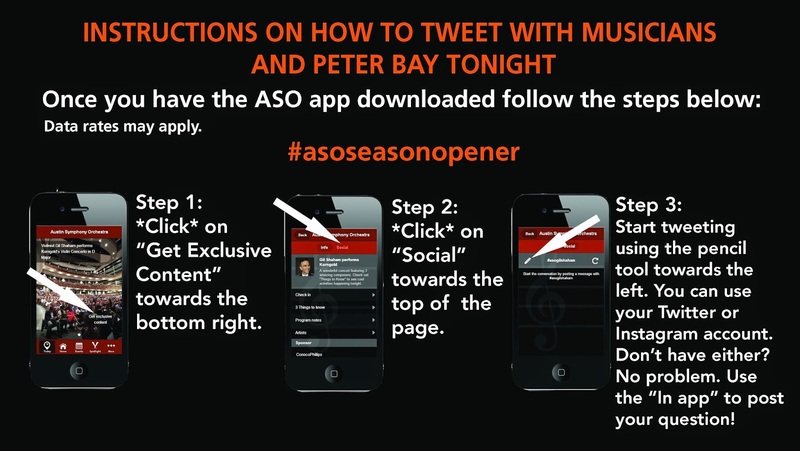 to download the ASO app to chat with Maestro Bay and musicians. A second slide provides instructions for downloading the app and using the Social screen. 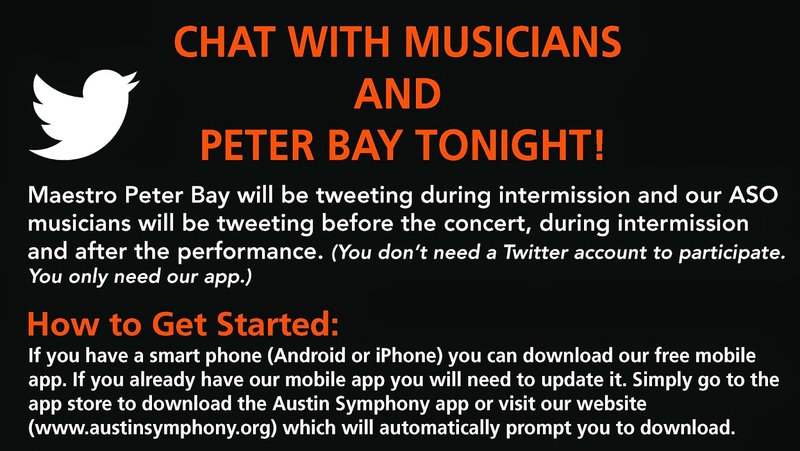 During intermission, Maestro Bay answers questions directly within the ASO app. Tweet Seats – In recent years, many performing arts organizations have experimented with “tweat seats” – a section of the audience (usually the back row or upper balcony) where audience members are encouraged to converse with one another during the performance via social media. The Social screen is a great tool for facilitating this form of interactive engagement. Some organizations set aside tweet seats for each performance. Others restrict tweet seats to specific performances. Still other organizations like Opera Omaha offer tweet seats to the final dress rehearsal for a production. If you are interested in trying tweet seats at your events, the Arts Management & Technology Lab published an article earlier this year highlighting lessons learned from their experiment with Carnegie Mellon University’s School of Music. Incentives – One tactic for spurring more participation in the Social area of your app is to include an incentive for patrons. With an incentive, the patron becomes eligible for a reward by simply engaging in the desired behavior. For example: In exchange for sharing a selfie or submitting a question, participants become eligible to win two tickets to an upcoming show. Tickets are one possible incentive, but not the only viable one. You could offer a chance to win a backstage tour, a free drink from the concession stand, , etc. Get creative! Reward recipients are often chosen by pulling participant names from a hat or a similarly randomized process. Another variation is to provide the reward to all participants. For example: Everyone who submits questions to the event’s hashtag is invited to a reception with the artist after the post-performance Q&A session. Contests – Take things up a notch by including a contest in the Social area. Contests differ from incentives in that they include a competitive element. Contests may be formal or informal in structure. An informal contest has a subjective judging process. For example: Audience members stop by the selfie station in the lobby before the performance and during intermission to take pictures of themselves with a violin. Guest artist Joshua Bell selects his favorite selfie at the end of the night, and the winner receives dinner for two from a local partner restaurant. A formal contest has more objective criteria for determining a winner. For example: Patrons are invited to download the app and take part in a trivia contest during intermission. A staff member posts a series of trivia questions on the Social screen. For each question, the first app user to post the correct answer wins an invitation to a backstage tour after the show.